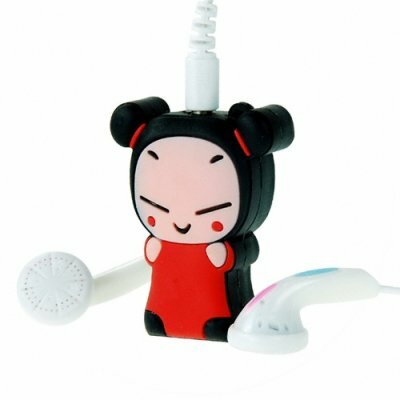 Successfully Added Cute Asian Girl MP3 Player to your Shopping Cart. Cute Asian bun girl necklace or pocket MP3 player. Cartoon character style MP3 player for those people who like to carry their music around in style. Small enough to be worn as a decorative necklace ornament or put comfortably into any pocket. This 1GB MP3 player has simple controls built into the back of the character and an internal rechargeable li-ion battery for hours of enjoyment between recharges. A great personal MP3 player or gift for people who enjoy unique Asian electronics. The CVSDW-9902 MP3 Player is proudly brought to you by Chinavasion Electronics. Order your stock now and don't forget to sell your customers additional add-on accessories like USB extension cables and MP3 carrying bags to maximize your profits. Cartoon Bun Girl Necklace or Pocket MP3 Player with 1GB of memory. La cubierta es de goma por lo que si se cae no se hace nada, es un regalo ideal para niños, ademas que el acabado del producto es realmente bueno!